Cream the butter and sugar together till pale, light and fluffy. Then beat in the vanilla, egg, zest, lemon juice and maple syrup. Slowly add the flour into the mix. Beat the mix until smooth and doughy. The dough is sticky and very soft. Remove from the bowl, wrap in cling film and then refrigerate to chill the dough (about 40 minutes to an hour). Meantime, preheat the oven to 180 degrees celsius (I bake mine at 170 degrees because I have a very hot oven). Dust your worktop, roll out the cookie dough to about 3-5 mm thickness (the next time I’m going to try and make them even thinner) and then use the cookie cutters of your choice. On an oven tray lined with baking parchment, set your cookies out about 1-2 cm apart and then bake for about 10 minutes or until pale and golden on the edges. Heat the blueberries, sugar and water in a saucepan and use a fork to mash up the blueberries. Cook until the blueberries sauce becomes syrupy. You can strain it but I just leave them all mashed up. The sauce will thicken when it cools. If you want to make a strawberry version, just replace the blueberries with strawberries. Mix all the ingredients together until the icing sugar’s completely dissolved. Pop it into the fridge to set. 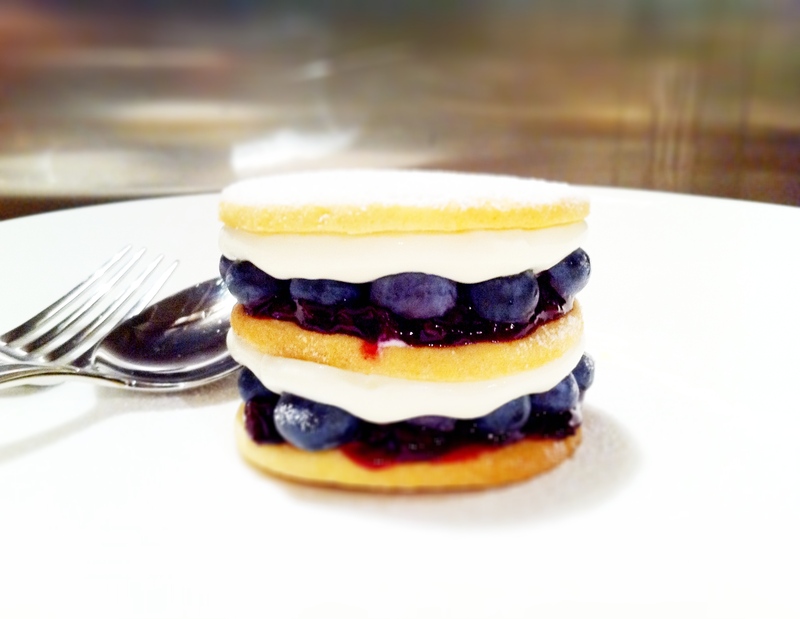 Place a biscuit on a place and spread some of your blueberry/strawberry sauce on it. You can of course just use blueberry jam or strawberry jam if you can’t be bothered making a sauce. I prefer this home-made version because it’s less sweet. Stick fresh blueberries/strawberries onto the jam – it helps keep the fruit in place. Now you can either pipe your lemon cream cheese onto the fruit but it’s just as easy to take another biscuit, put about 2 dollops of cream cheese on the underside and then simply pop that onto your fruit. Repeat again and dust icing sugar over the top biscuit before serving. This is gorgous, I should try making cheesecake this way some time. I really love to munch cheesecakes because they are oh so tasty. i really like to eat like 2 or 4 per day. ,’,;.